Aikido of Charlotte is a North Carolina Non-Profit Educational organization founded over 25 years ago and is the oldest, most experienced aikido dojo in the Charlotte area. Our Chief Instructor, Dennis Main Sensei, 6th Dan, Shidoin has over 45 years of experience and is the most senior aikido teacher in the Charlotte surrounding area. We are dedicated to the teaching of traditional Aikido as handed down from the Founder, Morihei Ueshiba (O’Sensei). We have an Air-conditioned stand-alone retail dojo with a 1, 600 sq. ft sprung mat system (72 tatami mats), shower, kitchen area, and dressing rooms just minutes from Uptown Charlotte and highly accessible from South Charlotte or the Lake Norman area. We have an “open mat” policy where you can come watch and/or participate in a class. We encourage fellow aikidoka from other dojos to come seek us out in their travels. We strive for a “friendly” atmosphere where we train seriously yet have a lot of fun at the same time. Dojo Operations are run by our Dojo Cho, J. Weiner Sensei, 4th Dan, Shidoin, please contact him for questions. Aikido is a traditional Japanese martial art created by Morihei Ueshiba (O-Sensei) in the early 20th century. As the physical practice of philosophical principles developed by O-Sensei, Aikido strives for the ultimate goal of peaceful resolution rather than defeat. Composed of three Japanese characters: Ai, meaning harmony; Ki, spirit or energy; and Do, the path or the way, the word Aikido thus signifies the “Way of Unifying Life Energy”. In this regard, O-Sensei created a martial art in which the preservation of one’s attacker is equally important as one’s own self defense. 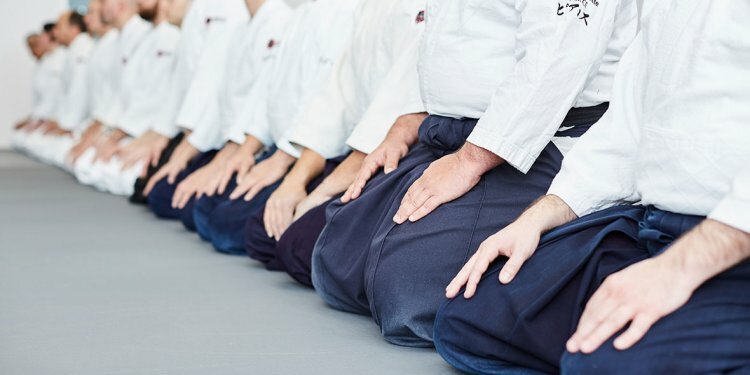 Aikido is more than the study of physical techniques; proper etiquette, attitude and behavior are also stressed. The basic movements of Aikido are circular in nature. The Aikidoist trains to harmonize with, rather than confront an aggressive line of force and converts it into a circular motion that renders attackers helpless. The Aikidoist trains to apply various wristlocks, arm pins or unbalancing throws to subdue and neutralize attackers without serious injury. Such practice is done in tandem with learning the art of falling, or “ukemi”, which trains the body and mind to receive such techniques in a safe manner. Aikido was developed by Morihei Ueshiba. To practitioners of Aikido he is more commonly known asO-Sensei (“Great Teacher”).